As one enters the 9th grade class or class 8th the discussion in the average Indian household gets centered on streams, subjects, courses and careers. Family members / relatives / neighbors / and almost everyone else known to a child becomes keenly watchful for the various suitable career options their child can pursue. And eventually, information from all sources is collected, analyzed, and discussed and the child is bombarded with information. Many students, themselves filled with confusion and uncertainty about their right career, come up with questions like, “tell me what will be the “In Thing” after 10 years (4 years in school and 6 years in college) and what course I should do which will lead me to that career”. Now, there is a common understanding that there are certain careers and fields which can be predicted to gain huge momentum in the future. For example: Robots are being used in many diverse fields like in manufacturing many types of products. Or like nanotechnology is taking the world by storm. But how robotics will evolve, or what new technology will come and start shaking the world in the next 10 years, nobody can say that with a 100% surety! We are in the information age and 5 years is considered a long duration! Even big countries publish annual labor reports and talk about employment outlook for a year or 2 years. So it is really difficult to predict which careers will do best after 10 years! 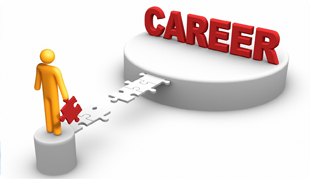 Even if we predict the careers, with what confidence level are we predicting the future careers with 10 years horizon? So rather than putting our energies in predicting what will happen in future, we should put our energies in preparing ourselves for the unpredictable world of work. Conventional wisdom says that no body and nothing can take away our education and skills from us. But industries are changing and life is moving at a very fast pace, so we should prepare ourselves for future careers and fields by building on our education and skills. So essentially, we should leverage on what we have. A 14 year old has the potential to learn, a will to do something and dreams for the future. We should help our youngsters to discover what they can learn best. A scientific and reliable aptitude test and personality test can be of great help in choosing the right career and the right direction and at the same time, keeping the flexibility to build a career around it. MapMyTalent offers one such aptitude test and personality test which can really help a student know what are their inherent strengths and weaknesses and what are the skills that they should work on. The online aptitude test will help the students in getting to know themselves better and thereby, it will help them groom and train themselves better for any role and responsibility in the future.